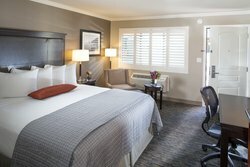 Make yourself at home at Best Western Plus Humboldt Bay Inn’s comfortable and convenient Eureka, California hotel rooms. 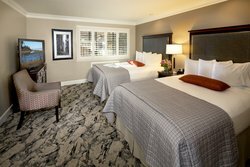 Whether you’re in town for a business trip, sporting event, or leisurely getaway, our recently remodeled Eureka, California lodging provides all the thoughtful amenities you need for a pleasant and memorable stay in Northern California. Each of our hotel rooms is well-appointed with all the amenities the modern traveler needs. Stay connected to home or work with free fibre optic Wi-Fi, watch all your favorite shows and movies on the 42” flat screen TV, dance to your favorite tunes using the MP3 compatible player that doubles as a clock radio, keep your snacks cold in the mini-fridge, and once your cravings kick in, warm them up in the microwave. 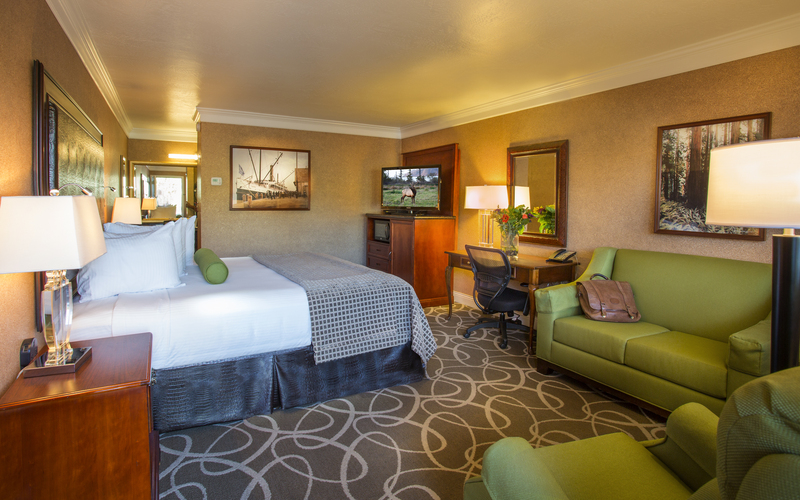 After a busy day, sink into a peaceful sleep on a Serta Master Suite bed at our Eureka, California lodging. Choose the Eureka accommodation that’s perfect for you! 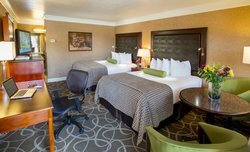 Our King and Two Double Beds guest rooms feature all the comforts you need, while our Deluxe King and Deluxe Double Queen rooms add that bit of additional space for you to stretch out after a busy day. Indulge in all the little extras, including plush bathrobes, luxury toiletries, an oversized business desk, and a DVD player with free DVD movies. In town for a special occasion? Make your celebrations even more memorable by staying in our Anniversary Suite – only bookable by phone. Don’t forget to treat yourself to the rest of our hotel amenities, including a free deluxe continental breakfast and a relaxing Oasis Spa Area. For the ideal place to stay, book our comfortable Eureka, California lodgings today! 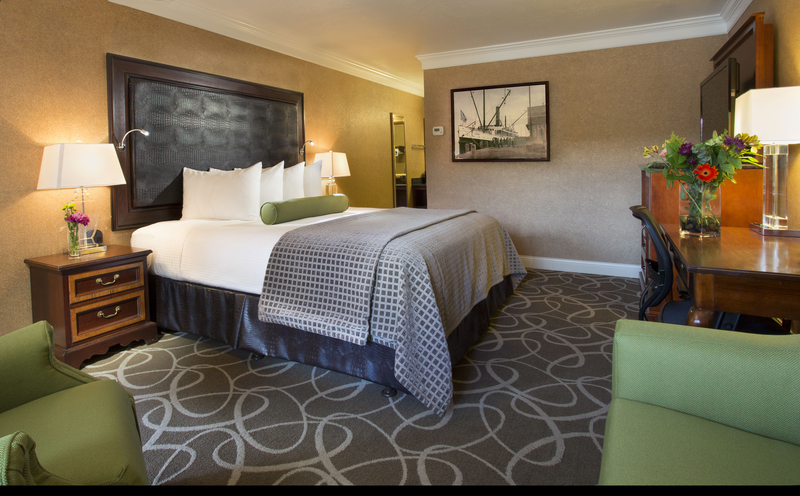 Whether you're traveling to Eureka for a romantic getaway or on a business trip, our King Rooms are a relaxing retreat after a busy day. Sleep well in a Serta Master Suite bed. Make a fresh cup of coffee or tea in the in-room coffee maker. Surf the Internet with our fast and free Wi-Fi service. Thoughtfully appointed with all the amenities a modern traveler needs. 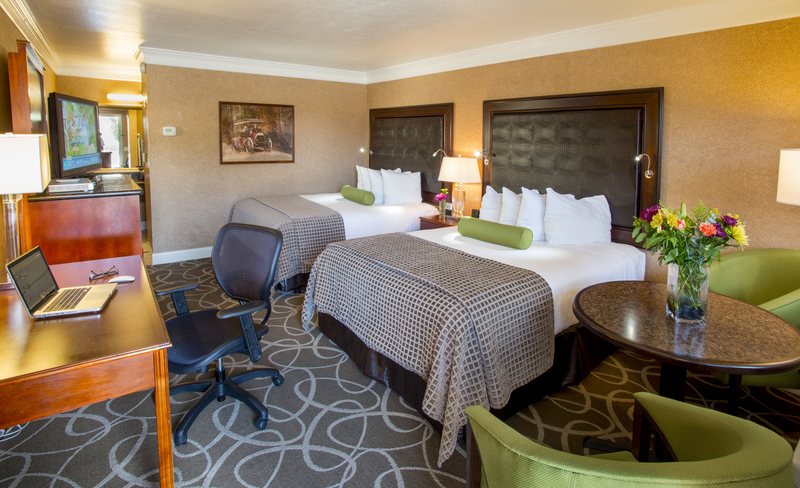 These guestrooms are furnished with two Serta Master Suite double beds. Take advantage of free Wi-Fi and enjoy new 42-inch LCD television entertainment. Other standard amenities include a hairdryer, coffeemaker and clock radio with MP3 player. Enjoy deluxe furnishing like a recliner and sofa. The 42-inch LCD television includes a DVD player and free DVD movies. In addition to standard amenities, the Deluxe King Room includes plush bathrobes and luxury toiletries in the bath. There's also an oversized business desk and swiveling ergonomic desk chair. Staying in our Deluxe Rooms mean you can indulge in all the little extras, including plush bathrobes, luxury toiletries, an oversized business desk, and a DVD player with free DVD movies. Our spacious Double Queen Room comes with deluxe amenities such as a recliner, sofa, and 42-inch LCD television with a DVD player and free DVD movies. The plush bathrobes, luxury toiletries, and oversized business desk are also complimentary. Unwind comfortably in this room which allows for full relaxation. Stretch out in our Deluxe Double Queen Rooms, perfect for a group looking for a bit of extra space! This room comes with deluxe amenities such as a recliner, sofa, and 42-inch LCD television with a DVD player and free DVD movies. Plush bathrobes, luxury toiletries, and an oversized business desk are also complimentary. The newly remodelled Anniversary Suite offers amazing perks. Cozy up to your very own private fireplace. Relax in the sitting area, which includes a wet bar, plush sofa and reclining easy chair. Enjoy entertainment on the 55-inch LCD TV. Relax in your personal Jacuzzi spa tub with separate walk-in shower. 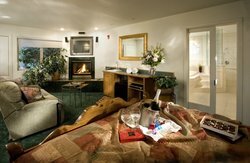 *Please call the hotel at 707-443-2234 to book the Anniversary Suite. Newly remodeled for ultimate luxury. Planning to celebrate some special moments in Eureka? Our Anniversary Suite, only bookable through phone call, features amazing perks. Cozy up around your very own private fireplace and relax in the sitting area, which includes a wet bar, plush sofa and reclining easy chair. Enjoy entertainment on the 55-inch LCD TV. And treat yourself to a soothing bath in your personal Jacuzzi spa tub with separate walk in shower!